For a chance to win a copy, please leave a comment saying why you’d like to read Sufficient Grace. 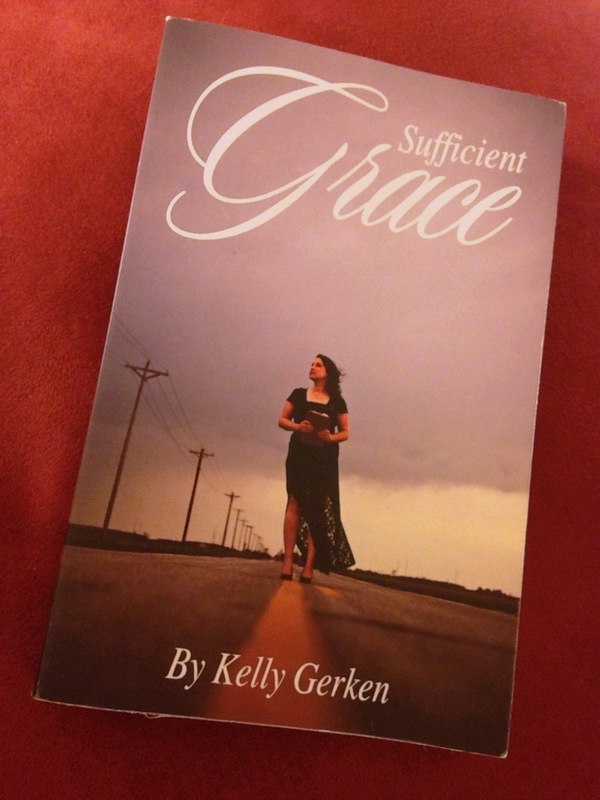 Kelly Gerken’s Sufficient Grace is the story of a couple whose relationship outlasted high school romance, teenage pregnancy, multiple losses, and questioned beliefs — even as their marriage fractured under the weight of grief and fear. It is the story of their children: Tim, their first son; Faith and Grace, twin daughters who were stillborn; Thomas, who died in Kelly’s arms shortly after birth; and James, their youngest. Ultimately, this is the story and testimony of a woman who discovered God’s faithfulness, love, and grace as her family navigated the deaths of three babies, and found her worth and purpose in Christ. The narrative construction of part one is quite beautiful as Kelly threads biblical verses, personal revelations, and pieces from her journals and blogs together in her telling. Through loss and heartache, through hope and happiness, she writes with honesty and sincerity. She openly admits her struggles as a young mother and new wife, the distance she felt from God, and the questioning of faith, disbelief, anger, and numbness that come with grief. Her voice is endearing with its humor, humility, and vulnerability. So much of what she expressed reflected and validated my own experiences: knowing her babies while they were in the womb (26), being grateful to be able to “do something, even if it was just labor” (35). One image Kelly used that was particularly striking was of liquid mercury, which she used to describe the moments she learned Faith and Grace died and heard Thomas’s fatal diagnosis: “Everything and everyone looked like liquid metal, warping, melting, rolling in senseless patterns without definite forms” (33). “I once again experienced that choking, liquid mercury feeling as I lay on the examination table” (59). And when she described holding Thomas as she sang him to heaven, of being “bathed in peace and an indescribable joy” (97), I thought of my first son and feeling that same peace and joy that seemed impossible until I held him. As I read her story, I ached with her and delighted in her joys. After losing Faith, Grace, and Thomas, then struggling with her subsequent surprise pregnancy with James, Kelly found her voice and calling. She gave herself to Christ, laying everything at His feet, and He led her to create Sufficient Grace Ministries to “comfort others with the comfort that [she] received” (153-154). The second part of the book describes this ministry. It began with Kelly making handmade memory books one by one and grew into a nonprofit resource for bereaved families around the world. Part Two also includes information on supporting a grieving loved one, information on couple and sibling grief, ways to honor and remember your baby, excerpts from the Walking with You series on the Sufficient Grace Ministries website, and other helpful resources. When I first started part two, I got confused because the chapters didn’t have the same narrative connection to each other that part one did. An introduction and a table of contents could help distinguish the two parts, and it would make it easier to find specific chapters for future reference. It would also be great to see examples from a wide range of mothers added to the “Ways to Remember our Children” chapter. Organizationally, “More Thoughts on Saying Goodbye, Dinah, and My Mother” felt a bit disconnected from the other chapters, and I think it may work better to place this special content within another section, such as in an afterward. The editors, unfortunately, also missed several typos and formatting/style inconsistencies, and I think they could have given more attention to helping Kelly cull and tighten some of the language to further strengthen her writing. Because her story is so powerful and because the work she does with Sufficient Grace Ministries is amazing and needs to be shared, I hope that Comfort Publishing is working with Kelly on a second edition to at least provide better copyediting. Sufficient Grace is an important book. It not only allows the bereaved Christian to admit weakness, to struggle, and to mourn, but also invites those who haven’t walked this path to abide in Kelly’s powerful story and gain understanding of how life-altering it is to lose your child. This book is a gentle, validating, and comforting companion that is so needed in the often lonely and isolating grief process. Kelly’s message is accessible, clear, and strong: You have not been forgotten in your time of pain and desperation; though you may feel forsaken, you are not alone. And God’s grace is sufficient to make beauty from your brokenness. Gerken, Kelly. Sufficient Grace . Concord: Comfort Publishing LLC, 2014. 225 pages. Print. ISBN: 978-1938388477. $8.40 at Amazon.com. Please note: I received this book from Comfort Publishing in exchange for my honest review. A second copy will be provided for this giveaway and the winner will be announced at the end of the month. I would like to win a copy of Sufficient Grace book because I lost my daughter, Faith 2 years ago in January 2013. I think the book will help continue my healing.